Eco-friendly. Photocatalytic. Air purifying. Nanotechnology. Talk about multi-tasking! PURETi is taking clean to a whole new level with industry-changing innovation. The active nanotechnology in PURETi makes it possible for just about any item to do double duty. A treated surface can be self-cleaning while also purifying the air around it. What if objects around you could actually take poisonous compounds – that, up to now, you’ve been breathing – out of the air? That’s what’s happening right now on busy streets near the University of Sheffield in the United Kingdom. Large signs on University buildings are coated with PURETi, a revolutionary cleaning product that contains nanoparticles of titanium dioxide. The particles get excited when light hits them, which causes a reaction with oxygen. This reactivity creates an impressive cleaning effect like no other compound can. Studies of the PURETi-treated University poster have revealed that the excited nanoparticles actually eliminate car, truck and bus emissions of nitrogen oxides. Nitrogen oxides are invisible particles that have been linked to breathing problems, which particularly affect children, the elderly, and people with asthma, emphysema and bronchitis. But nitrogen oxides also affect even the healthiest person. Take a walk or jog near a busy street on a hot, sunny day and you can’t help but notice increased breathing difficulties. 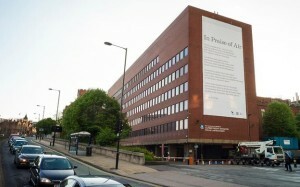 The PURETi-coated sign at the University of Sheffield is roughly the size of a highway billboard and has been found to eliminate the pollution of 20 vehicles per day. Imagine if every sign, banner, light post, and bench in your community was coated with pollution fighters. Even windows can be coated and used to purify the air. This product may literally make it possible for everyone to breathe easier. The nanotechnology used to create the PURETi coating for signs is advanced science. More and more everyday products are being combined with the tiniest parts of helpful molecules to create amazing results. Tony Ryan, the University of Sheffield professor who convinced his employer to install titanium dioxide signs on their buildings, is hoping to develop a laundry detergent with the same nanoparticles. He believes that clothes washed in this detergent would soak up pollutants. Are people ready to wear a chemical reaction? A lot of investors think so and are connecting to products like Ryan’s laundry detergent and air purifying product coatings. The technology part of nanotechnology is so fine-tuned and precise (remember, it’s all happening at the sub-molecular level) that the nanoparticles do their job without negative side effects. Even though the particles are excited and working hard, no activity can be seen or felt. The nanotechnology itself is amazing… so a high product cost could be expected. But the price is very affordable relative to the results. The PURETi coating for signs is long lasting and, as long as there is light, constant. No special equipment or protective clothing is needed to install coated signs. A PURETi-treated billboard-sized sign can cost only about $200 more than an uncoated sign. With sustainability and corporate responsibility becoming more important to consumers, investing in nanotechnology to fight air pollution is a very affordable way for businesses to support their home communities. Excited inventors working with excited particles to clean the air, and excited companies using the technology as a way to be stronger community partners—PURETi is proof that science and commerce can work together to achieve amazing results that benefit everyone. The Grime Stoppers is the ONLY local provider of advanced PURETi products. If you would like to learn more about how PURETi can help your business or institution rise above the rest, contact us today or call (618) 223-8445.